Zorro was an interesting sight on the steps outside the School Of The Arts. He didn’t seem that unusual when placed against the surge of people crossing the road in the direction of Plaza Singapura–young men and women sporting shocks of red and green hair, arts school students and other pedestrians in shirts bearing anime motifs. His strident voice seemed somewhat muffled against the crowd as he crooned out a soulful ballad in Japanese, strumming on his guitar. What really set him apart was the little cardboard placard at his feet that read ‘From Japan!’–and the roguish warmth of his smile that he flashed me as I approached him, bringing to mind his namesake. In halting English we struck up a conversation, where he revealed the ambition behind his modest performance by the street. From under his nondescript appearance shone a carefree cheerfulness, brimming from the joy of a free spirit that seems to have found a fulfilling release through his music. “I’m travelling the world. I came from Japan. I come to Singapore because I heard it’s good for buskers. Earlier I was in the Philippines, but there the public order is very bad, and the divide between the rich and the poor is very big. After this I’m going to Malaysia, and from there I’ll be travelling to Central Asia, Middle East, Central America, South America, North America and maybe after that I will travel back to Japan. I told my parents; they’re just a little worried for my safety. Before this I lived in Australia and New Zealand. The nature there is very beautiful. My dream has been to travel the world since I was fifteen years old. I learnt to play the guitar since I was young, but I mostly played for fun until recently. The suitcase contains all my belongings–sleeping bags, food, etc. 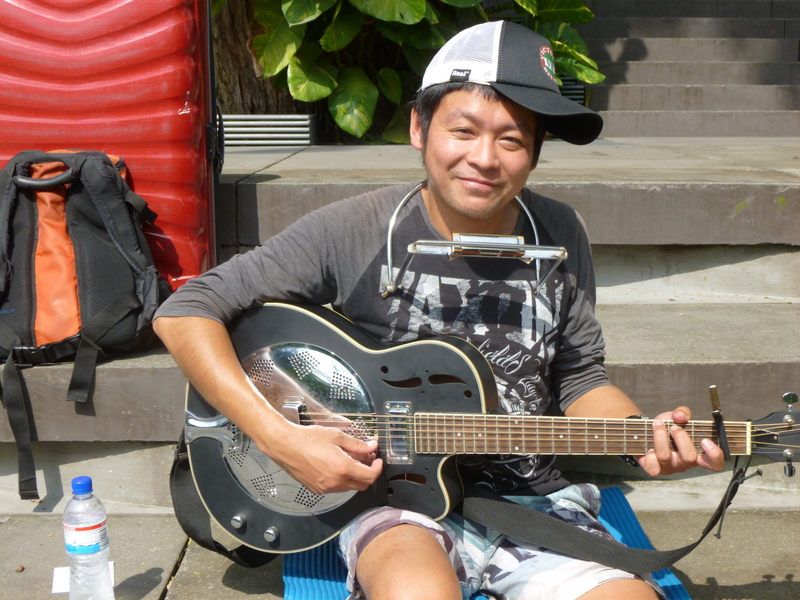 I earn the money to travel by busking. I stay in one country to busk for a while before moving on to another country. I want to be able to produce my own series, and practicing through busking can help me to become good enough. We ended our conversation with a mutual handshake. As I went on my way, I couldn’t help but be struck at how his sentiments seemed to echo my own. Perhaps in some way we are all travellers, and it’s the chance meetings we have when we collide with others on their own path that lead to the most meaningful experiences.